Melissa Kwasny's Putting on the Dog discusses the hotly debated topic of the use of animals in fashion. Join us in unpacking this exploration of cultural narratives, animal rights, and the slow fashion movement in a neutral context. 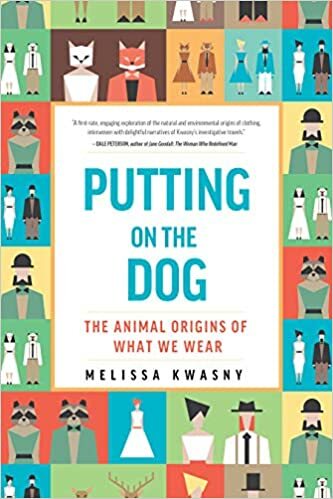 Putting on the Dog explores the age-old relationship between humans and animals, providing fascinating details about the historic use of animals as clothing. In the exploratory spirit of The Orchid Thief and The Omnivore's Dilemma, Melissa Kwasny travels the globe gathering firsthand accounts of traditions and manufacturing methods, from aboriginal to modern, as she investigates the phenomenology of silk, skin, wool, feathers, and pearls, long coveted materials that even now are regarded as precious and luxurious. From brain-tanning of elk hide in Montana to the shearing of wild sheep off the coast of Maine, Kwasny investigates the cultural history of fashion, highlighting the people who are working toward preserving our relationship with animals both imaginatively and physically. Visiting current industrial manufacturers and meeting people who have spent their lives working with animals and subsisting on the materials they provide--farmers, ranchers, tanners, weavers, shepherds, and artisans--Kwasny examines historical rates of human consumption and overconsumption of these materials, as well as current efforts to mitigate environmental and ethical damage and move toward sustainability. Though Kwasny does consider concerns of animal rights groups, Putting on the Dog is not an anti-hunting or anti-trapping or anti-farming book. From silkworms grown on plantations in Japan to mink farms off Denmark's western coast and pearl beds in the Sea of Cortés, the book focuses more on the ways people work with animals and what we should learn from those exchanges. Animal welfare, worker safety, environmental health, sustainable practices, product accountability, and respect for indigenous knowledge and practice--consumer awareness of these things is driving change in the fashion industry, creating a slow fashion movement. At its heart, Putting on the Dog examines the historic ceremonial and practical use of animals as clothing, helping us bridge the growing rift between human consciousness and consumption with the interdependence and sustenance that the natural world offers us. Melissa Kwasny is the author of six collections of poems, including Pictograph, Reading Novalis in Montana, and The Nine Senses, which contains a series of poems that won the Poetry Society of America's 2008 Cecil Hemly Award. A portion of Pictograph received the Alice Fay Di Castagnola Award, judged by Ed Roberson. Kwasny is also the author of Earth Recitals: Essays on Image and Vision and has edited multiple anthologies, including Toward the Open Field: Poets on the Art of Poetry, 1800-1950 and, with M. L. Smoker, I Go to the Ruined Place: Contemporary Poems in Defense of Global Human Rights. Kwasny's work has appeared in Ploughshares, the Boston Review, and The Arcadia Project: North American Postmodern Pastoral. She lives in the Elkhorn Mountains outside of Jefferson City, Montana. This event is free and open to the public. Most of our events are held upstairs, but we do not have an elevator. To join the signing line and have books signed by the author at this event, please consider purchasing your copy of Putting on the Dog from Country Bookshelf, either in-store, over the phone, or online (scroll down). By purchasing your book from Country Bookshelf, you are not only supporting a locally owned, independent business, but you are also showing publishers that they should continue sending authors to Country Bookshelf. The author's previous titles will be available for purchase at the event as supplies last.